← Half a month left, but really you only need one day. 24 hours left! Well, story more than that, but basically there’s today and tomorrow and that’s it. We’re gearing up for the awesome zines that will be coming in. We’ll blog here when we get all the scans done and the gallery up. In the meantime, you have a quick 24 to finally participate! Eee! Go do it! 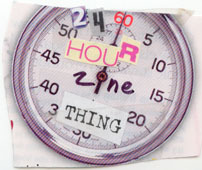 Who waited until the last day to make their zine? I want to participate!!! I tried to sign up last week but the page was down…I just read your post (assuming that was you who posted it?) in a zine community on LJ about leaving a comment on the main page. so, err, here I am! goal: to write something that’s introspective yet inclusive and which won’t put readers to sleep, and to shove some interesting artwork (mine or otherwise) in there.